I rarely place my liver in someone else’s hands. Nor my tastebuds at someone else’s mercy. But I trust Steve implicitly. The Karkli Sherpa knows his beer. And he knows the great beer city that is Sheffield. For the second time, Steve did the planning and pulled together a route and several venues I hadn’t even heard of. But just knew were going to be excellent. So, following the obligatory quick beer in The Sheffield Tap, we jumped the tram…… to Hillsborough. Jumping off on Langsett Road and strolling down to Penistone Road. To stop number one. First impressions as we approached the front were “The Rutland…..” with a very similar look to the external tiling. I’m on record about my adoration of multi roomed pubs. And The New Barrack hit all the right notes with several rooms, one of which had its own bar. Next to the live music room. Needing something light to start with I opted for a pale session beer from Acorn. Absolutely spot on and really refreshing after the walk from the tram. A belting pub with superb beer. I kind of expected nothing less. 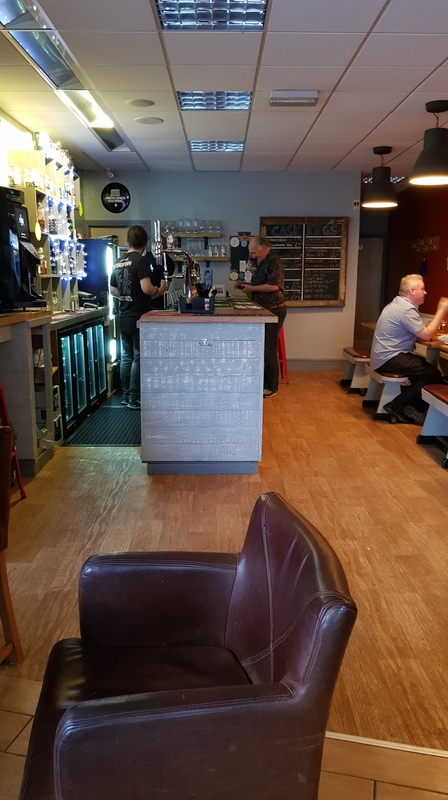 A more modern pub, this place is open plan inside, divided into two distinctly separate areas, both with plenty of seating and I believe it does superb food. 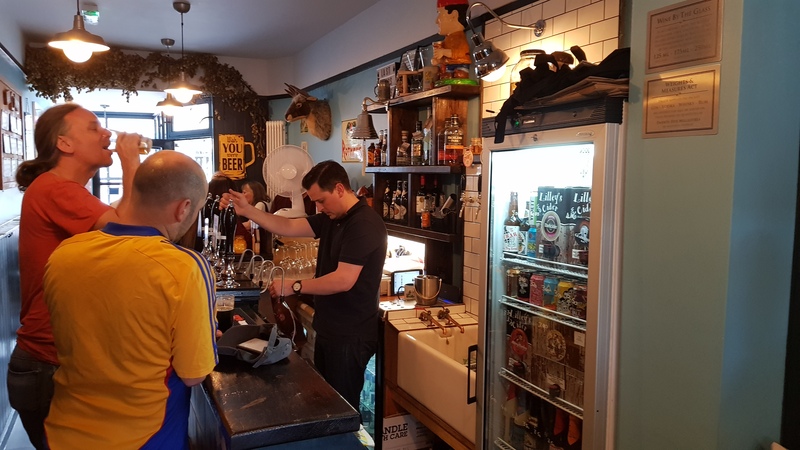 What it also does is have an excellent and large beer selection and – unsurprisingly for Sheffield – outside drinking areas with excellent hill views. A number of different choices amongst our happy band, but I went t for the Old Rasputin Stout from Tollgate. And bloody good it was too. Nice and roasty, like all Stouts should be. 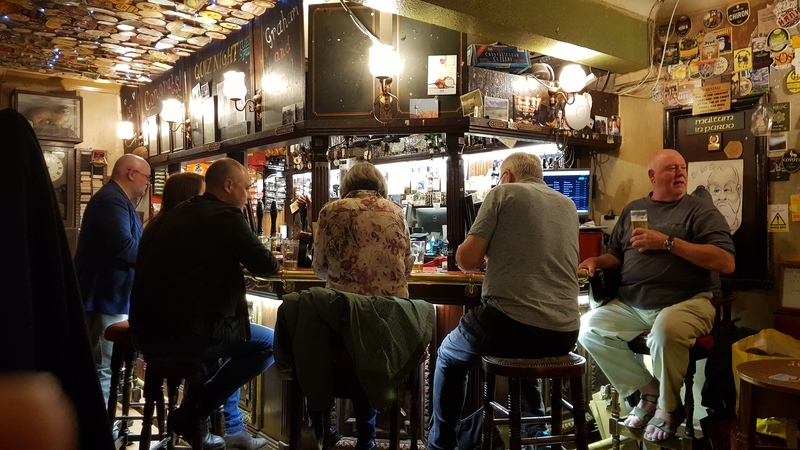 Being a pub crawl – and with an advanced ticket for the 20:11 back to Piccadilly, we were on a tight schedule… So back onto Langsett Road, then carrying onto Infirmary Road back towards town…. Last time I came to this lovely pub, it was the home of The Little Ale Cart brewery. Fast forward a couple of years and it’s now home to Neepsend Brewery. I’ve had a few of their beers and have yet to be disappointed. 7 handpumps, with 4 for Neepsend and three for guests and 4 keg taps. Upping the strength here, I jumped on the single hopped Waimea IPA. And it was lovely. 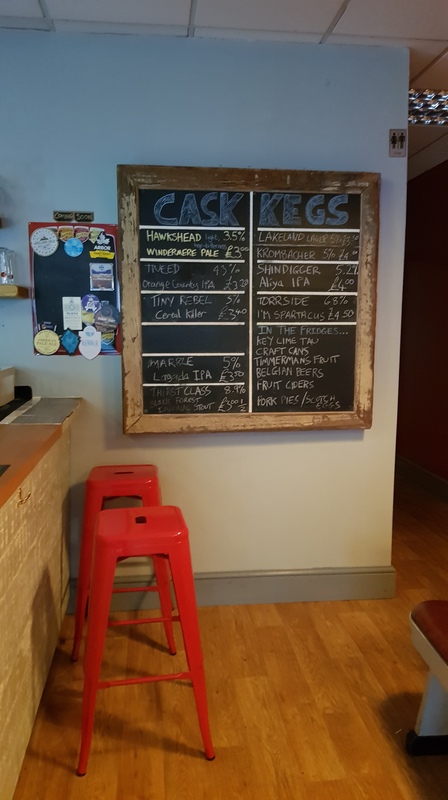 And it was even better on keg – Lee’s choice – with the carbonation enhancing the hoppy bite. Three distinct rooms in this multi room gem, with some lovely stained glass going on. This pub is – again – another pub with lovely outside drinking space. I’ve been saying for a while now, that Sheffield is a city full of great pubs. This is another example. Back onto Penistone Road, turning right onto Rutland Road over the River Don and left onto Neepsend Lane, to…. This was kind of the start of when the beer details get hazy! But I was a bit distracted… As you will see. 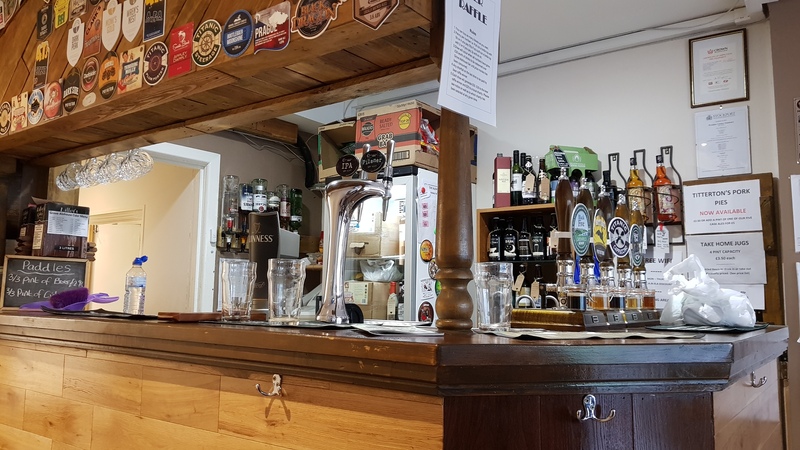 Two roomed pub that was bought by members of the local community in April and has a focus as a community hub outside (and inside) opening hours. It also happens to be a lovely pub. Nice Porter if I recall, but – nipping into the next room – a surprise was lurking…. Don’t ask who won. My opponents would get upset – even if Elaine couldn’t have been more of a shark if she was wearing a dorsal finish accompanied by doom laden strings. Time to move on : Right from the pub along Neepsend Lane onto Burton Road, then left onto Hicks Street…. To a more modern gem…. Oh my. Steve warned me that I’d like this. Looking like a modern conversion of an old industrial building, this bright and airy space was – let’s say simply – a bit different to what had gone before. And not in a bad way. 8 keg lines. From near and far. But craving the local, I bagged the Lost Industry / Hoptimism collab Sour Sundae – a banana & cherry lacto smoothie. Beautiful stuff. A complete package. The place is bright and spacious with plenty of seating. The sour and the pinchos were ace together. And this is a fabulous modern bar. I think we all loved it. And I do love a psychedelic jellyfish…. A little diversion to the Vegan Beer Festival was next. Not exactly loads of beer really, more food orientated. And as much as the vegan eggs fascinated, the Bad Seed bar was my focus and an excellent Cherry Imperial Stout. Always nice to chat with Chris and talk a little…… business. Back on the walking again…. 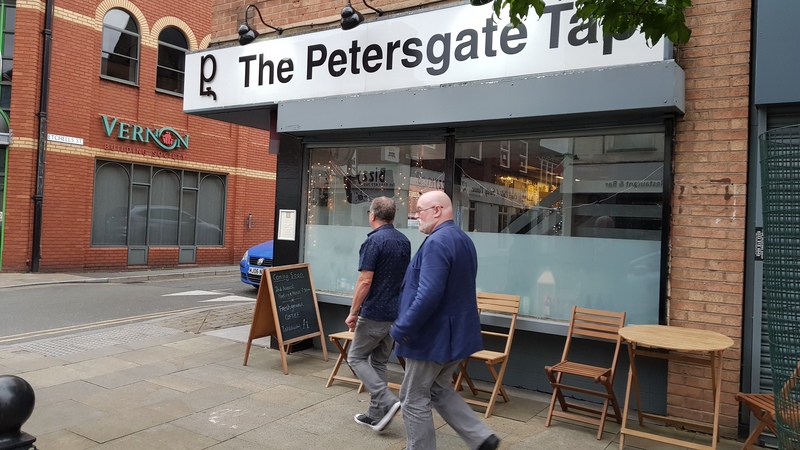 Sheffield’s newest bar, opening only this week,placed opposite The Shakespeare, a small open room – nice and bright and rightly bustling. 6 keg lines and four cask. Belting pint of Hopjacker Grifter Stout. A nice place with a bit of a NQ vibe. Which is praise. Is like to have seen one or two more local beers, but nice to see a Cwrw Ial beer on the bar. The next – and final – stop, was unusual. In that the walk was 15 seconds long. A Sheffield classic with plenty to choose from on both cask and keg. Again, multi-roomed with more excellent outside space – that Sheffield hallmark. North Riding Mosaic. Just bloody gorgeous, especially at this stage. There’s not much I can say about this pub that hasn’t been said already. Each room is different, it’s a bit rambling. It’s a Sheffield classic. And – if you haven’t been before – a must visit. A fabulous day out. And heartily recommended. Sheffield really is a special city for drinking. It may not have the density of breweries that central Manchester has. But it more than makes up for it with the sheer volume of quality pubs. I feel this won’t be the last time I walk around this lovely city. Well. Where else was this going to end? 4 Trains, 3 Micro Pubs and a Canine Legend. I love drinking in Manchester. But sometimes, I just fancy something a bit different. Like yesterday. I was at a loose end. Mrs BM was in Liverpool and I was in recovery from the fabulous Mallinsons wedding do the night before. I needed a “pick me up”. I had a System One County Card, a mobile phone and some cash. And fancied a little impromptu pub crawl. And – to be fair – a feasibility test for a more lengthy affair later this year. 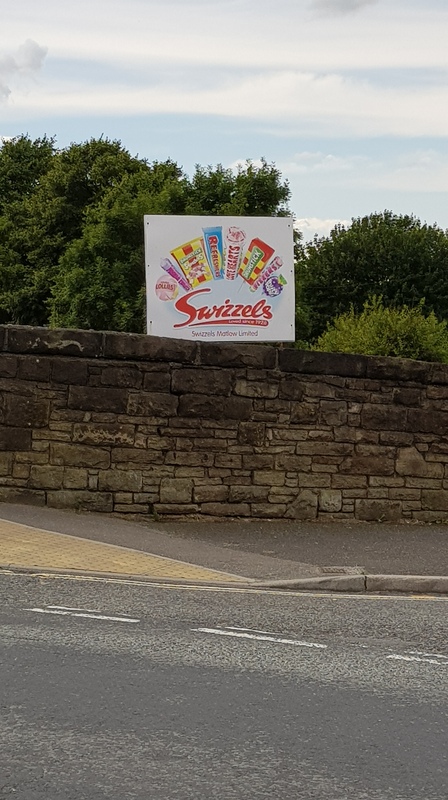 So I let the train take the strain…..
Swizzles. New Mills’ greatest export. But now – a beery sense, there is another good reason to catch the train. Open for about a year, owner Russell has got himself a little gem here. Small – and I mean SMALL – but making fabulous use of the space he’s got, at peak, you can apparently get 60 in. And that would indeed be snug. 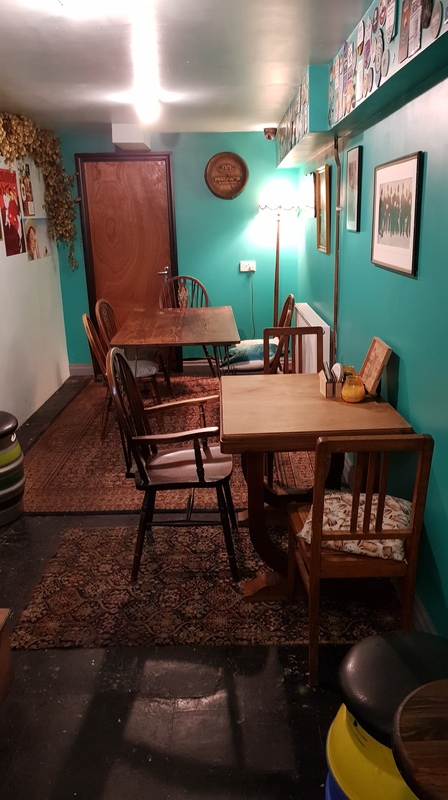 But this is a sweet sweet space for a beer or 3 – abt 5 (energetic) minutes walk from New Mills Central Station. Yes. It has 2 stations. As devotees of Torrside Taps will know. The beer selection was excellent and all spot on. Snap Decisions by Torrside was an obvious (and local) choice. Cracking Rye Pale with that little spice in the finish. Two Yorkshire beers too, from Brew York (Jarsa – Session Pale) and Wishbone (Divination APA) both on keg. Both superb. I have friends in New Mills who come here regularly. I’m not surprised. It’s a great little bar. Friendly staff, friendly locals, with whom we chatted a bit. Russell has done a great job. Next, a walk to New Mills Newtown station and the Stockport line – give yourself an easy 20 minute stroll (or 12 for the more energetic…) and a couple of stops down the line to Hazel Grove. Then down Station Street, onto Davenport Road and right onto Hope Street to the A6. Where you’ll be facing…. 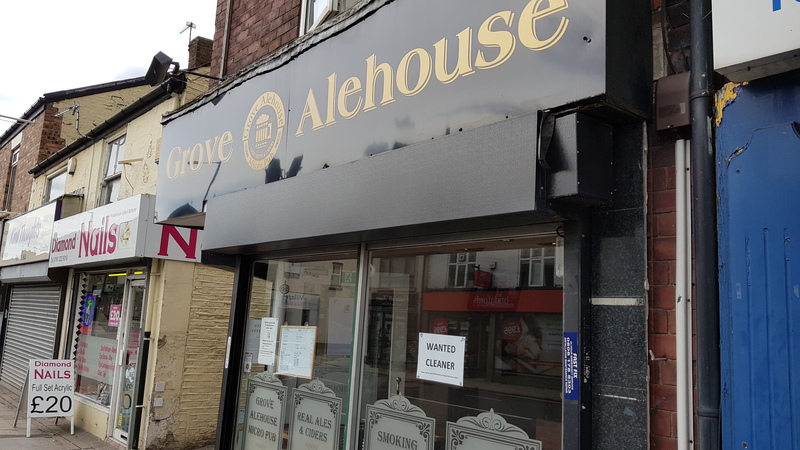 The Grove Alehouse – London Road, Hazel Grove. 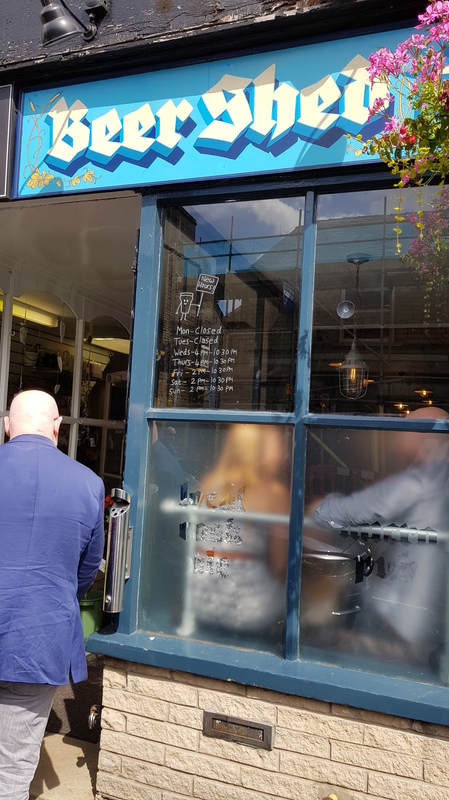 Sat on the main A6 out of Stockport, this Micro pub is a bit more spacious with more tables out front and some outside space to the rear. Again, a friendly welcome (This friendly stuff ain’t rocket science…) and four cask pumps to the fore. Greenfield, Poynton & Titanic breweries here. I went dark. And was rewarded by excellent pints of Greenfield “Black Five” and Titanic “Cappuccino Stout”. In an area dominated by Robinsons, this place brings welcome choice. And seems to be doing quite well. Well kept beer and a friendly welcome. Like I said, not rocket science. I’ll be back. As it was, back to Hazel Grove station and the short run to Stockport. And another place new to me. From the station onto Station Rd, turn left onto the A6 then right onto St Petersgate…. The bottom of that cask list had me. And I think I may have had the best pint of Lagonda I’ve ever had. Absolutely singing. Lightly tart and fruity, refreshing, full of flavour. All kinds of yum. Pub on two levels, with upstairs really spacious. Plenty of seating and comfort downstairs. Knowledgeable and – dare I use the F Word again? – friendly staff, just add the excellent beer list. I loved this place. All there was left to do was that Black Forest Imperial Stout from Thirst Class. Choccy. Cherry. Boozy. Right up my street. And only £3 a half. I know this won’t be universally accepted, but – for me – cask (properly kept) is the best way to dispense Imperial Stouts. So bite me. Did I say I like this place? This will be on the extended route later this year. After this – I’ll bypass the (Arch Nemesis suggested) misstep and say that we popped into two Stockport institutions. Not much in the way of words – according to the “lovely” daughter, I was doing a passable impersonation of Rowley Birkin QC – but the pictures will do the job…. 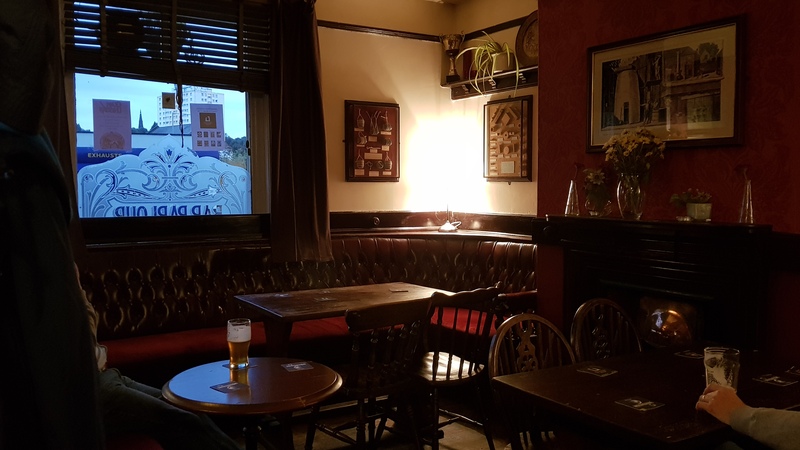 Just a beautiful multi roomed freehouse – but tonight, with an Abbeydale tap takeover…. Then onto everybody’s favourite pre-train watering hole. 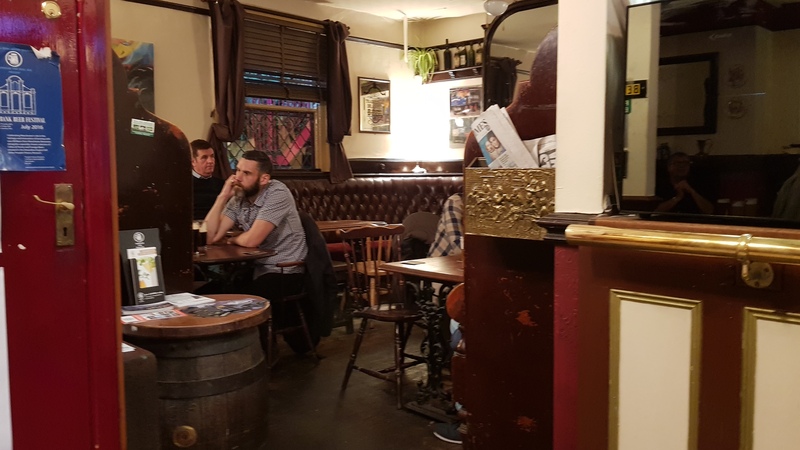 Ye Olde Vic – Chatham Street. Drinking beers and then writing about them. It is that straightforward. Travelling TheAleTrail - Seeking out the planets finest beers!